Coinhive Miner is the PUP that uses misleading techniques to prevent removal. Use Reimage to locate malicious components and get rid of them faster than with uninstall instructions. A full system scan blocks virus reappearance and prevents traffic to malicious domains. 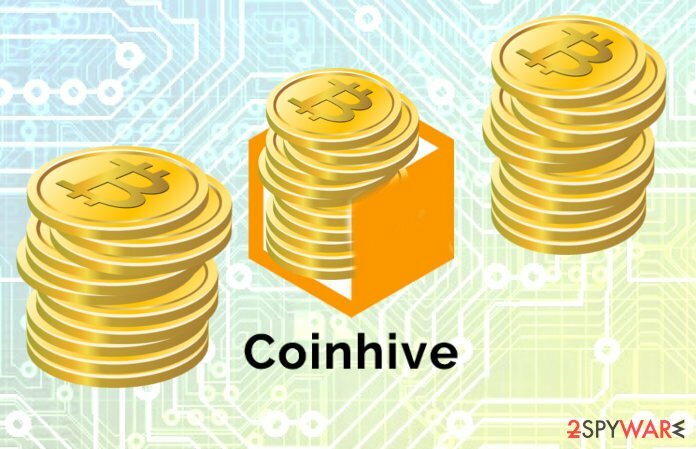 Initially, the legitimate cryptocurrency miner my Coinhive was developed to help users and websites' owners make an exchange — people allow to utilize their CPU in exchange for ad-free experience during their browsing sessions. Despite how tempting this solution seems, it has become the base of most cryptojacking attacks. In other terms, after users found a way to earn money by mining digital coins, they encountered a problem. Mining process takes a considerable amount of time. In order to speed it up, various tools have been used: from computer processors, video cards up to the ASIC chips specifically designed for this process. However, cyber crooks do not always have financial resources to buy such equipment (or simply are unwilling to do so). Likewise, they want to make illegal and quick profits by secretly embedding the Coinhive virus to mine cryptocurrency at the expense of other people's resources. Users should be aware that long periods of cryptocurrency mining leave no computing resources to complete other processes. Thus, their computers can significantly slow down, start freezing and fail to open or load regular programs. In some rare cases, they can become completely unusable because of the Coinhive miner! Likewise, we strongly suggest you remove Coinhive virus to protect your computer's well-being. Reimage is the perfect choice if you want to do it quickly without putting much effort. Merely download an antivirus and let it scan your computer files to identify and eliminate the infection. Also, Coinhive virus removal is a must to stop criminals from exploiting legitimate services. Note that as long as you keep visiting malicious websites and giving your CPU power, criminals will keep receiving funds to continue their activity. Thus, do not hesitate and check your system for Monero miner right now. 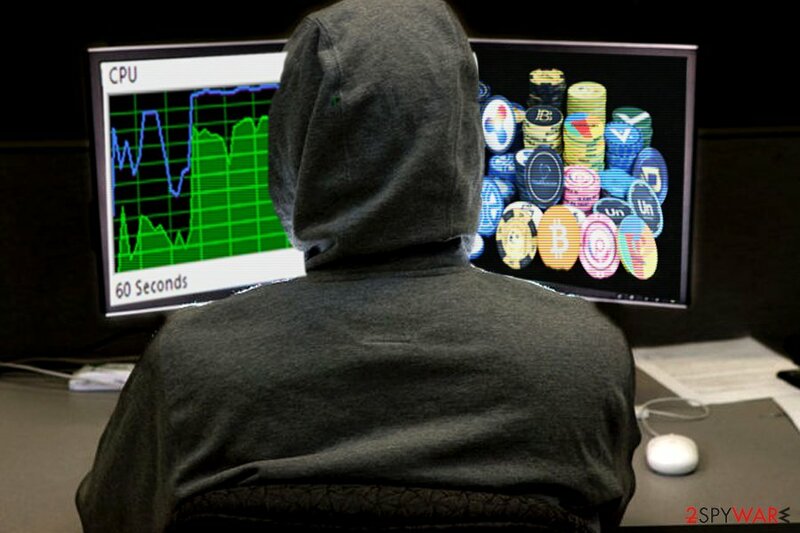 Even though the crypto-mining services is still a novelty in the cyberspace, hackers have already used them in several substantial cryptojacking attacks. They try to embed the malicious code on websites where people spend more time to increase their illegal profits. Felons disguise the mentioned script in all possible means and browser extensions are one of them. One of such sample is SafeBrowse. It is likely that fraudsters might plague popular apps, change their source code and corrupt them with the Coinhive Miner. Android users should be especially vigilant as Android OS is still highly vulnerable which encourages the surge of Android virus variations. Additionally, malware developers create a fake equivalent website based on popular domains, such as twitter.com.com. This typo domain technique is not new since it was used for infecting users with malware. One of the prominent samples is Amazon-based fake web pages. Since users often mistype the domain URL address, imagine what profit felons receive after dozens or hundreds of visitor accidentally visit their pages. However, knowing human greed for money, fraudsters already go on the offensive and deceive users into installing Coinhive Miner in the form of different apps and hacked sites. Despite plenty of information about phishing attacks in tech support scams, people still tend to fall for fake messages which are urging to either call the criminals or download so-called security software. Since the new era of blockchains has begun, criminals switched their tactics to mine cryptocurrencies during such attacks. Now when you get redirected to a website which claims that you have been infected with the Zeus virus and urges you do the suggested action within 5 seconds, you have to make a rush. Instead of complying with the demands, you have to quickly exit the page since the longer you stay there, the more crypto coins you will mine for the racketeers. To make matters worse, fraudsters may attempt you to lock you inside these web pages. In that case, you have to shut down the webpage forcefully via the Task Manager. Lastly, in order to redirect users to the websites with the hidden Coinhive Miner script, crooks also make use of the old technique – adware. This potentially unwanted program, which is designed to modify your browser and direct its traffic to specific sites, happens to be a perfect way. 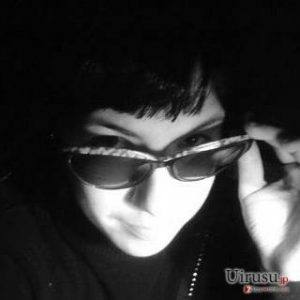 What is more, this type of browser malware does not only come in the form of an independent app but functions via AutoConfigURL and similar scripts. Ordinary users may not notice its presence until the stream of ads floods their computer screens. 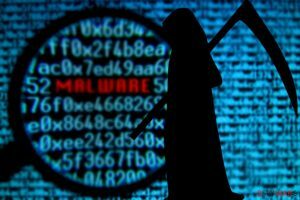 On the other hand, despite how inevitable and invincible this new malware strategy might seem, there are ways how to get rid of Coinhive Miner or detect another crypto coin mining script present on your system. check Task Manager and look for apps which use over 30% of CPU memory resources. Finally, if you suspect that coin-mining malware has settled on your computer, scan the computer with different malware elimination utilities. Try using Reimage, Malwarebytes MalwarebytesCombo Cleaner, and Plumbytes Anti-MalwareMalwarebytes Malwarebytes to detect and remove Coinhive miner or other offsprings of this virus. Note Coinhive miner removal simply depends on the antivirus software you use. If it is robust enough to detect the bogus website and its code, you will be safe. Otherwise, it would be smart to reconsider your security program choices. ^ Robert Abel . Tech support scam used to spread cryptominer Coinhive's Monero. SCMedia.The cyber security source. ^ Joon Ian Wong. How to tell if your computer is secretly mining cryptocurrency, and what to do about it. Quartz. News, videos, ideas, and obessions from the new global economy. This entry was posted on 2019-04-01 at 04:02 and is filed under Malware, Viruses. You can quickly scan the QR code with your mobile device and have Coinhive Miner manual removal instructions right in your pocket. How did you remove Coinhive Miner?